WASHINGTON (Reuters) - The United States imposed sanctions on Tuesday against Venezuela's state-run gold mining company Minerven and its president, Adrian Perdomo, accusing them of illicit operations and propping up the government of President Nicolas Maduro. "Treasury is targeting gold processor Minerven and its president for propping up the inner circle of the corrupt Maduro regime," U.S. Treasury Secretary Steven Mnuchin said in a statement. "We will aggressively pursue those involved with Maduro’s reckless illicit gold trade which is contributing to this financial, humanitarian, and environmental crisis," Mnuchin said. Venezuela's opposition leader Juan Guaido, who invoked the constitution to assume the interim presidency in January saying Maduro's re-election was not legitimate, has sought to prevent the gold sales, arguing that Maduro uses the proceeds to try to stay solvent. Most Western countries have backed Guaido as Venezuela's head of state. 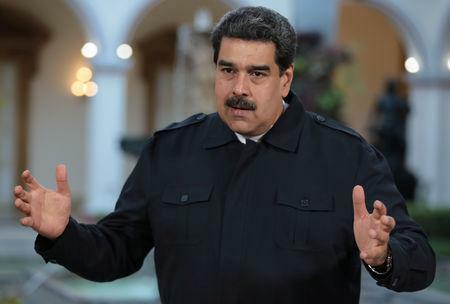 Venezuela's opposition has accused Maduro of selling the country's gold holdings to Turkey and the United Arab Emirates without approval by the opposition-led National Assembly. The U.S. Treasury accused Maduro's government of maintaining the support of the military by giving military officers "liberal access to the mines." "This furthers Maduro’s ability to maintain power over the military, as its desire to protect this illicit income reinforces the military’s staunch loyalty to Maduro," the Treasury said.